Nigerian Clash on tap… begins tomorrow! Hold on to your hats! 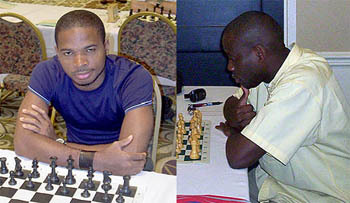 Chess players and fans alike will descend upon Houston, Texas to witnes a historic match between Nigerian National Champion, Chikwere Onyekwere and Nigerian International Master Oladapo Adu. The long-awaited match will be held in Houston, Texas, USA which has perhaps the largest concentration of Nigerians outside of Nigeria. The match was conceived late last year and will also feature a side tournament for those attending the match. Kunle Elegbede, a tireless promoter for Nigeria chess, is the mastermind of the event and promises a memorable event. Nigerians will be traveling far and wide to participating in the festival and chess fans will have a chance to follow the match. The Chess Drum plans to provide coverage of the event. 1st Houston Naija Chess Tournament 5SS, 40/2, SD/1 (2-day option, rd. 1 G/60), Windsor Hotel (Crown Plaza Hotel), 9090 Southwest Freeway, Houston, TX. http://www.windsorsuites-houston.com. $$ (4,000 b/100, 50% G). 2 Sections: Over 2000, EF: $40 if rec'd by 3/23, $50 at site. $$ 650-$450-$250. Under 2000, EF: $35 if rec'd by 3/23, $50 at site. $$ 350-$200-$100. Both, 3-day reg. ends 3/30 7 pm, rds. 3/30 7:30, 3/31 1-7:30, 4/1 9-3:30. 2-day reg. ends 3/31 9:30 am, rds. 10-1-7:30, 4/1 9-3:30. Thursday, 3/29-Sunday, 4/1: 6-game match between IM Oladapo Adu and Chikwere Onyekwere, http://nigerianchessplayers.blogspot.com HR: $55, 1-2, single or double, mention "Chess Challenge Match." Info: Kay chesswiz_king@hotmail.com or (832) 665-9786. Ent: where to mail entries.